COLUMBUS, Ohio — With a school and personal-record 399.45 in the three-meter finals of the 2018 NCAA Division I Women’s Swimming and Diving Championships, freshman Brooke Schultz claims Arkansas’ third diving individual national title in school history on Friday. 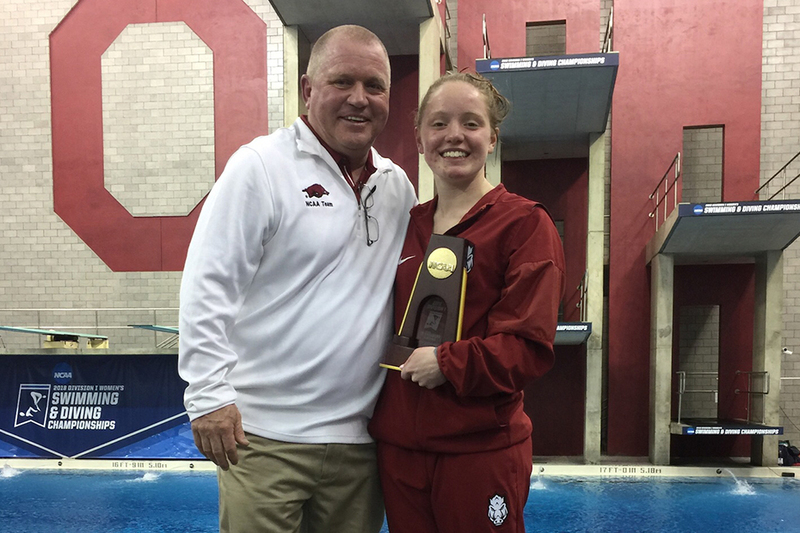 The two-time SEC Champion can add a national championship trophy to the collection, as the Fayetteville native climbed back to win Arkansas’ second three-meter title and first since 1985, after trailing by 27.15 points with two dives to go. She scored her two best dives of the finals, scoring a 67.50 on a back two and half somersault pike, followed by a 72.00 on the inward two and a half somersault pike to edge out Nevada’s Sharae Zheng, who scored a 394.95. Schultz advanced to the finals, pacing the field in prelims with a score of 384.60. Also competing in the three-meter was fellow freshman Maha Amer. Amer scored a 318.90 in prelims to finish 13th and advance to the consolation round, where she scored a 280.05 to finish eighth in the event, 16th overall. The final day for action for Arkansas begins at 11:15 CT with the platform prelims.